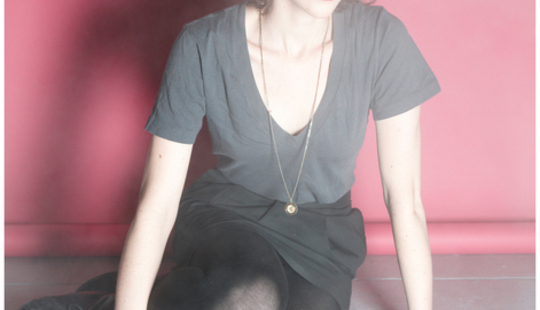 Because we’re not a bunch of deaf idiots, one of the more favoured albums of 2009 at DiS towers has been St Vincent’s Actor, the gloriously mannered baroque-pop second set from onetime Polyphonic Spree and Illinoismaker member Annie Clark, which Chris Power gave a sturdy 8/10 to a couple of months back. DiS caught up with her in a noisy ICA bar just before she bewitched London town with her rich fairytale spell of Thirties glamour, lustrous woodwind, screeching guitar noise and flowing electronics. Ensure you imagine her every word spoken in the most polite tones imaginable, first taking care to crank up the charmingometre to 'bouncy castle full of kittens'. DiS: Hey, so how’s the UK treating you? Annie Clark: It’s good, we’ve been here five days maybe? DiS: Has this been kind of a leisurely trip, then? AC: Sorry. There’s no such thing as a leisurely trip! DiS: I just looked at your schedule and thought you only had, like, six dates in two weeks. AC: Oh really? Yeah, aside from a travel day, I think we’re playing everyday. DiS: Well that was a fairly useless piece of non-information to swot up on. So last time you were here you played solo, this time you’re with a band – how’s that different for you? It must be a pretty different experience? AC: It is! Playing solo you’re relying on a lot of technology [leans right into dictaphone] I’m just going to talk right into this because I need to save my voice. I rely on a lot of technology when I play solo, so I’m crossing my fingers and saying a prayer that nothing goes terribly terribly wrong. So playing this band is like a musical couch: sit back, relax... good times. DiS: The way I understand is that you write songs using computer generated instruments; does that make it a challenge to arrange live? AC: Um, well, none of the songs were recorded, like, live, you know “let’s track it live, let’s get the energy”, that just wasn’t conducive to the song or the process. But I would write using in the box instruments, and then I would record actual instruments, so it would start off very electronic and then becomes much more fleshed out in the recording process. DiS: Yeah, I wonder what your demos sound like, are they actually noticeably electronic, or is it basically pretty similar to the final product? AC: Um, yeah, I was using GarageBand or Logic Studio and I don’t know that somebody with a super trained ear wouldn’t be able to say “oh, that’s not a real flute”; but it sounds like a facsimile of a flute or a saxophone or a French horn and I used that, blended the fake ones blended with real ones on a song like ‘Marrow’, same with ‘Just The Same But Brand New’. DiS: When you could basically do anything with that technology, play any instrument, how do you stop yourself going completely nuts? Do you set any restrictions on yourself? AC: I think you have to make some decisions pretty early on or else you’ll be swimming through the entire process, so I made the decision really early on to use only woodwinds, not a lot of strings, focusing mainly on clarinet and saxophone... and flute as well, so kind of setting parameters, or otherwise you’ll keep swimming forever. DiS: Did cutting your teeth in The Polyphonic Spree and Sufjan Stevens’ band help as an arranger, do you think? AC: Um, yeah, I mean, with Sufjan you just turned up, because he knew exactly what he wanted you to play every time, so you were there as an instrument to play an instrument to play a part, but yeah, with this record I just tried to get more intricate with what I do and make the intricate parts more intricate and the delicate parts more delicate. DiS: I mean can you just get completely lost tinkering for hours? AC: Yeah... I mean, I did that, I’m very capable of - sometimes to my detriment - of going down the lab and getting really microscopic, of getting really fractal. But I think actually that on some level helps, there’s a lot of math in the whole effort, things being inverted, things being used again, melodies getting timed or double timed or transposed, reversed. You can’t necessarily hear it; I mean, you can hear it, but you won’t necessarily think "oh, that’s a mirror image of itself, that’s a transposition notationally of the first part." But you know that’s what it is. DiS: Do you enjoy that process? AC: Oh I do, I can nerd out real good, you don’t necessarily hear it so much as perceive that mathematical counter melody... I’ve thought about that a lot. DiS: Like math rock without the rock. DiS: Back to the band thing... is it a purely financial thing deciding whether to play solo or non solo? AC: There are decisions more artistic than financial, I enjoy playing solo, just so long as I don’t feel it’s compromised. DiS: You’ve obviously worked with large ensembles in the past – if somebody gave you a blank cheque would you like to arrange your music for a live orchestra or whatever? AC: I would, yeah, on a sort of limited show by show thing, I don’t think I would love to tour with 20 people, but I would love to do that, totally do that. DiS: Have you picked up some good benevolent dictator tips from Tim DeLaughter and Sufjan? AC: [mock scared] Er, yes, benevolent dictators. Indeed. DiS: The reception for Actor has probably been more enthusiastic than for your debut, Marry Me; do you feel it’s a step up too? AC: I do. I’m closer to it than other people are, but growing up in any capacity is kind of like patting your young self on the head and going “ah, you tried, that’s sweet”, you’re always trying to outdo what you’ve done. It’s less of a romantic record. DiS: Yeah, there’s some vicious stuff on there, you actually pay attention to the lyrics to ‘The Strangers’ and it’s like “wow”. DiS: The venom in your words doesn't carry to your voice; why adopt that blanker style? Are there any versions recorded where you screech through it a bit? AC: Well, 'The Strangers' I was picturing somebody like Joan Crawford singing it, somebody very decadent, spoiled by luxury, but also I think that just for me personally, my own brand of subversion is of classic American middle class repression, I don’t have a rock’n’roll voice, I have a pretty little voice, it makes sense to me to to use that. DiS: How do films influence your songs exactly? You’ve said Actor was based on the Criterion Collection, how does that work? Is it really 'you' singing, or do you kind of steal bits of classic film characters? AC: Well I think on this record, it’s an emotionally true record, but it’s like that disclaimer at the start of a film, lyrics that actually represent people or places have been changed... You know you have your own well of personal and emotional experiences, but sometimes it’s best looked at from a different point of view, with some fiction in for spice. DiS: So at what point did Joan Crawford pop into your head? Did the song pre-date the idea of her singing it? AC: Vocally when I was singing it in the studio I was trying a couple of different ways of singing it, and when it clicked for me was when I pictured Joan Crawford in a throw you know, lounging and saying these venomous lines sort of blasé, spoiled by luxury, and that kind of helped me get into the song. DiS: The actual repeat refrain "paint the black hole blacker" - does that mean sort of exacerbating a situation out of sort of playful deviousness? AC: Yeah, it’s from a Philip Roth novel, The Plot Against America, and when I read that line I thought -“I love that, I love Roth”-. But yeah, that’s how I interpreted it, as a mixture of futility and malevolence. DiS: Those refrain vocals really set the tone for the album for me, especially when I'm trying to explain it to other people, that sort of pre-rock’n’roll feel - what were you aiming for, exactly? AC: I was actually going for a kind of Company B, high energy thing... just sort of brilliant and fluffy, so yeah, I was going for that. DiS: Have you ever wanted to be more involved in the filmic world? The song ‘Actor Out Of Work’, or at least its video, would certainly suggest a wider interest in that universe. DiS: But I guess maybe something like a score? AC: I’d love to score a film, that’d be awesome. DiS: I mean, following on from you not wanting to be an actor, that video and all your press shots have you adopt this blank, profoundly unnaturalistic expression; is the abiding logic behind that some sort of ‘St Vincent’ persona, as opposed to Annie Clark? AC: Um, well I think that there’s an artistic answer, which is that I like that you would see a photo and it’s almost a blank canvas, you’re not giving me a sense of place you know, smiling or whatever, you’re not giving over a lot, it means you don’t know what to expect from the music. But the nuts and bolts answer is: have you ever had your photograph taken a lot? It’s mortifying and you’re not sure... it taken an hour to get loose, and you make stupid faces accidentally that you’d never make in real life, that’s the non-artistic answer. DiS: But is there any difference between St Vincent and Annie, would you say? AC: No, but I love performing, it’s awesome, it’s such a big release, I probably feel more alive performing or being creative than I do any time. I think probably in real life. DiS: Yeah, I guess I was going down that route because I read some interview with you where you pretty much said St Vincent was an arbitrary moniker, I just wondered if it had taken on any further meaning to you after two albums trading as it? DiS: Wow... don’t you, like, have eight siblings? AC: Yeah, but different people at different ages, you know? AC: [In spectactularly earnest fashion] Thank you very much for your interesting questions. DiS: Wow, they told me you were super nice. DiS: Oh, okay, I’ll tell everyone you’re a monster. AC: Yeah, yeah, you should definitely do that. St. Vincent "The Strangers" from Lake Fever Sessions on Vimeo.